In partnership with Humanities Texas and the Texas Film Commission, Texas Archive of the Moving Image (TAMI) will bring its award-winning Texas Film Round-Up to Wichita Falls. 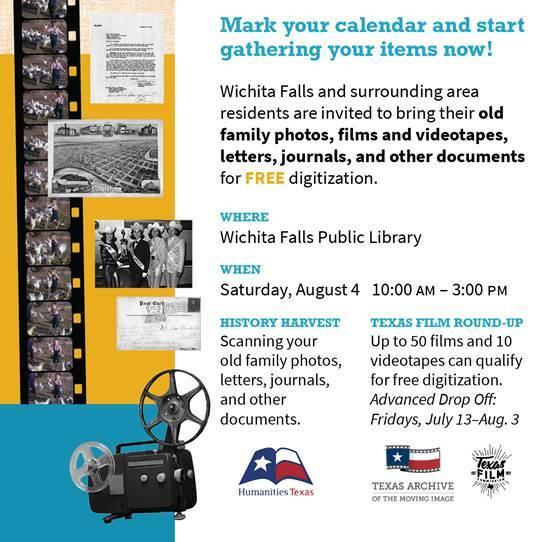 On Saturday, August 4, Wichita Falls and surrounding area residents are invited to bring their old family photos, films and videotapes, letters, journals, and other documents for FREE digitization. Advance drop-off is welcome at the Wichita Falls Public Library during business hours (9:00 a.m. - 5:00 p.m.) every Friday, July 13, 20, 27, and August 3. Humanities Texas staff and volunteers from the sponsoring organizations will review and scan your historic family photos, letters, journals, and other documents on-site. The original items will be returned to you the same day along with a digital copy. The History Harvest will create a community collection from the area’s families to document our local, regional and national heritage.